Sirleaf once again stood for president as the candidate of the Unity Party in the 2005 general election. She placed second in the first round of voting behind footballer George Weah. In the subsequent run-off election, Sirleaf earned 59% of the vote to 40% for Weah, though Weah disputed the results. The announcement of the new leader was postponed until further investigations were carried out. On 23 November 2005, Sirleaf was declared the winner of the Liberian election and confirmed as the country's next president. Her inauguration, attended by many foreign dignitaries, including United States Secretary of State Condoleezza Rice and First Lady Laura Bush, took place on 16 January 2006. 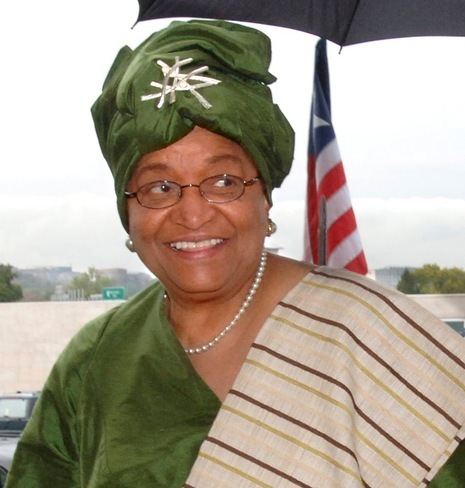 “Tell them to stop leaning on the fence!” Ellen Johnson Sirleaf, president of Liberia and the first woman ever elected head of state on the continent of Africa, ordered the leader of her security team. We were driving along one of the scarce paved avenues in her nation’s capital, Monrovia. With her convoy rode United Nations gunmen, part of a peacekeeping force of 10,000 charged with preventing a conflagration in the aftermath of 14 years of horrific civil war. The fighting ended in 2003, but outside the windows of Sirleaf’s S.U.V., the skeletons of abandoned buildings and the cries, at once thrilled and desperate, of the onlookers along the president’s route were signs of the country’s position near last on any list of how well the world’s nations are functioning. When Ellen Johnson Sirleaf launched her campaign to become president of Liberia, conventional wisdom rated her chances as slim to none. No African woman had ever won a presidential election. The presumed front-runner, George Weah, was a charismatic political novice, three decades her junior, whose international soccer fame had made him a national hero and household name, especially among Liberia's largely unemployed youth. To stand a chance of winning, Sirleaf had to find a way to rise to the top of a heap that included 21 other candidates.